Awhile back, I posted a short series of descriptions of work on the stock pen at East Shumala on my layout. The general background for small stock pens, and my design intentions, were presented in the first post in the series (it can be found at: http://modelingthesp.blogspot.com/2015/03/a-stock-pen-for-east-shumala.html ). 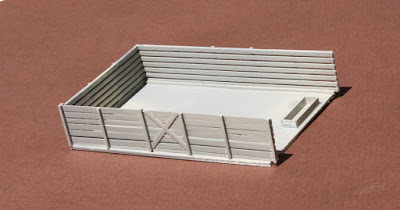 I followed up that post with a second article about how I built the basic stock pen from a kit, with some added fencing (that post is at this link: http://modelingthesp.blogspot.com/2015/06/the-east-shumala-stock-pen-part-2.html ). I added two structures to the stock pen complex, a traditional California tankhouse and an office. Descriptions of the modeling work, or additional links for those projects, were in the third post in the series (you can read it at: http://modelingthesp.blogspot.com/2015/10/east-shumala-stock-pen-part-3-office.html ). The present post shows completion of the complex by adding a third pen. As the two pens in the original AHM kit were about 15 by 25 scale feet in size, I chose to make the third pen the same size, even though this is smaller than most prototype stock pens. 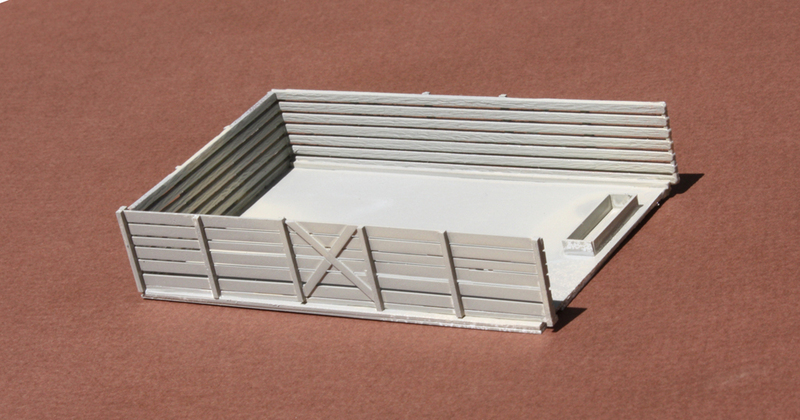 The simple way of making the added pen was to use sheet styrene for a base, and build fencing using styrene strip. That was the basic construction method of the added fencing for the AHM kit also. I showed the fencing method in Part 2 of this series, accessible at the link at the end of the top paragraph in the present post. In the photo below, the added pen has been assembled and given a primer coat of light gray. I added a watering trough with pieces of scale 2 x 12-inch styrene strip. The next step is painting the fencing a weathered wood color, then adding soil to the “floor” of the pen. I will match the previous parts of the stock pen fencing by painting with Star brand "Seasoned Wood” brown. But before I went further, I had to face up to the topic of populating the pens with suitable animals. 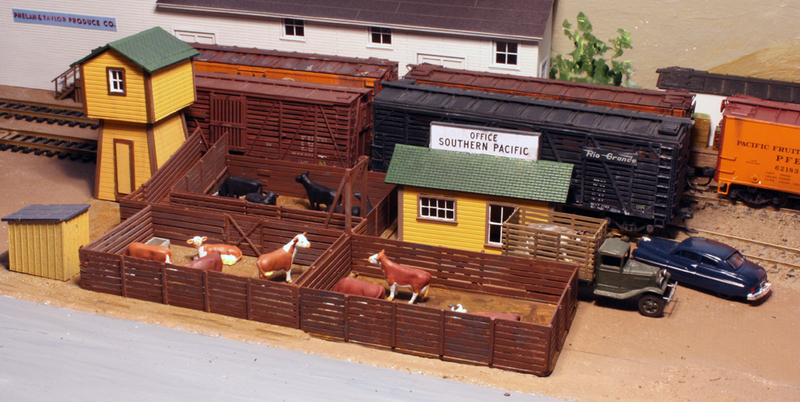 The area I model is one which includes ranching with beef cattle, so any modeled cattle on my layout should be breeds used for beef, not dairy cattle. The most prominent breed of dairy cattle in the U.S. is the Holstein, the familiar black and white “splotched” animals, so I wouldn’t use those. Beef breeds in the west are primarily Hereford, with some Angus. The former are reddish brown with white heads, stockings and bellies, while the latter are entirely black. I show below photos of each breed, found on the web. 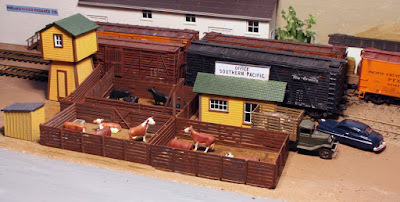 As it happens, Woodland Scenics makes nice sets of both Hereford and Angus cattle, and I bought some sets of each. I also had a few Holstein animals in my stash of figures, which I simply repainted to either Hereford or Angus colors. One has a base, and can be put just inside the front fence so the base won’t show. Any other bases were cut off. I have been told that the old Weston cattle (offered by Campbell Scale Models) were excellent renditions of the animals, but I have none of those. Since my fleet of stock cars includes some double-deck cars, I will explore having some model sheep or hogs to substitute for cattle, when such cars show up in the operation cycle. 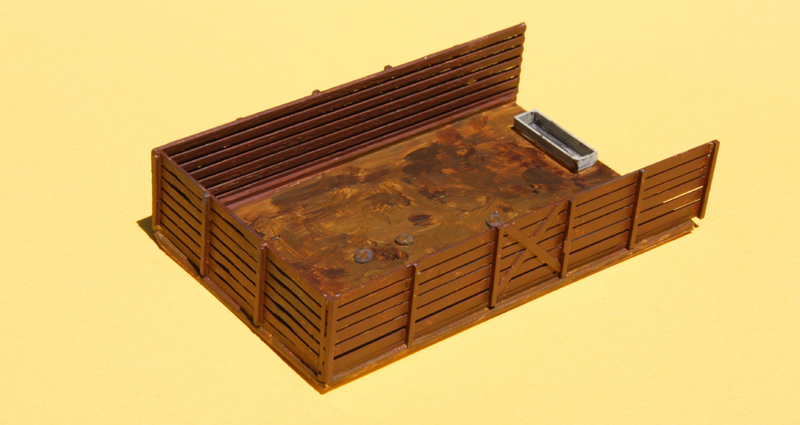 To color the soil area inside the stock pen, I repeated what I had done on the pen floors of the kit parts, namely to use tube acrylics, mixing Raw Umber and Yellow Oxide. I took advantage of the thickness of the paint in this form to make the soil area look a little less than flat. Finally, here is the added pen, in place at the stock pen location in my layout area of East Shumala. The tankhouse and office alluded to earlier are visible here. The area is still being scenicked, so does not look complete as to soil and vegetation. I have been waiting to do ground cover, bushes etc. until structures were all done. I am pleased to finally have my three stock pens, as planned, to serve at this industry. A full load of stock in a railroad stock car is more cattle or sheep than most people ever display in their layout stock pens, an effect I hope to minimize. Of course, stock might be delivered over a few days until the full load is ready to go, but there should still be more in the pen than a mere handful. Populating a cattle pen is not as easy as it used to be. I bought two Lifelike cattle loading pens at $12.00 each to amass 20 head of reasonable Herefords. I discarded the Lifelike toy pens but kept the watering trough that came with each. I have painted them but they need a little more variation in color. I also bought a small herd of 16 indistinguishable breeds from a Walthers stock pen accessory pack now discontinued on eBay. That gives me 36 head to pack a 40 X 40 foot pen for my proposed Walnut Creek 1947-54 Cameo/diorama type layout. The Campbell cattle are excellent, but I think the Revell Hereford cattle (not the milk cows)were the best. They were nicely painted, too. I have a few of them. The majority of my cattle are from Walthers. They do require painting. I happen to have a Hereford hide, so I made custom mixes to match that.